Bernie and Bernadette were living in a Chesterfield, Missouri house they had come to call home, but not every aspect of their space was a dream. The list of home renovations seemed to pile up: the entry missing any form of weather shielding, paint flaking off of the exterior trim, a cramped and poorly designed kitchen, outdated cabinets and appliances, bathrooms needing updating, and—though the house was only a few years old—overall wear and tear appearing on both the exterior and interior of the home. 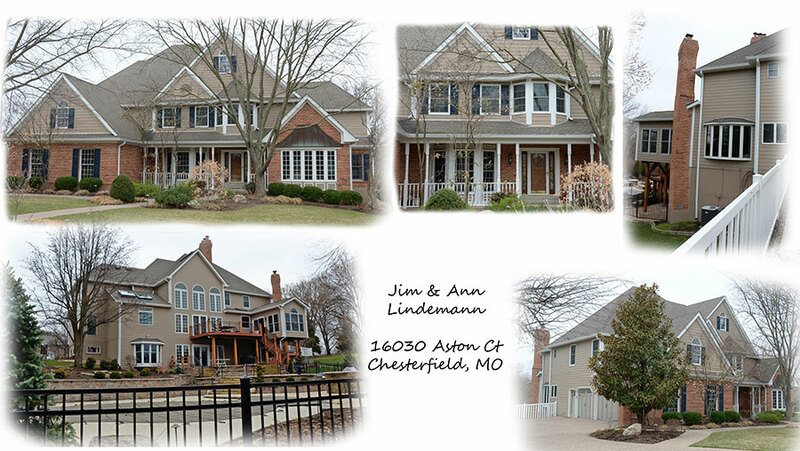 The couple heard about Lakeside Exteriors through a professional relationship, and upon seeing high satisfaction reviews from former clients, the couple decided on Lakeside for their much-needed home renovations. While the list of needed improvements was long, the couple decided to take the jump and began their exterior home renovations. Starting with the home’s exterior, Lakeside replaced the roof before moving to the outdated siding and flaking trim. Lakeside Exteriors jumped in, bringing the clients top notch materials with the highest quality of work, replacing the outdated siding with a no maintenance HardiePlank siding from James Hardie, new fascia and soffits, custom designed shutters, and beautiful trim and dentil molding, which took the exterior from a poorly kept structure to a breath of fresh air. 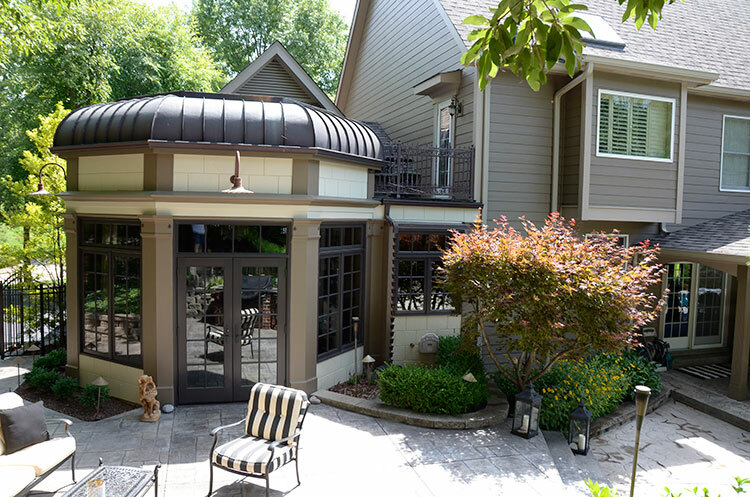 When the couple began wanting to expand and renovate other elements of their home, the impression Lakeside Exteriors had left made their choice of contractor no brainer. “Everyone at Lakeside Exteriors was so professional and friendly, which is so refreshing,” owner Bernadette has since stated. 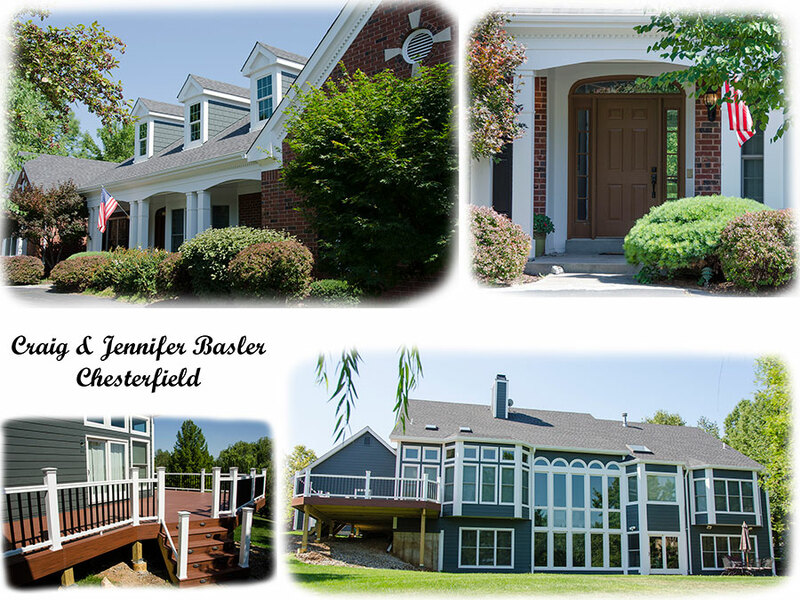 It was not only the project quality but also the business quality that led to the couple using Lakeside Exteriors for all their home improvement needs. Over a two-year period, the couple had Lakeside Exteriors renovate and update their gutters and gutter protection, front entryway, kitchen expansion, patio, and a bathroom. 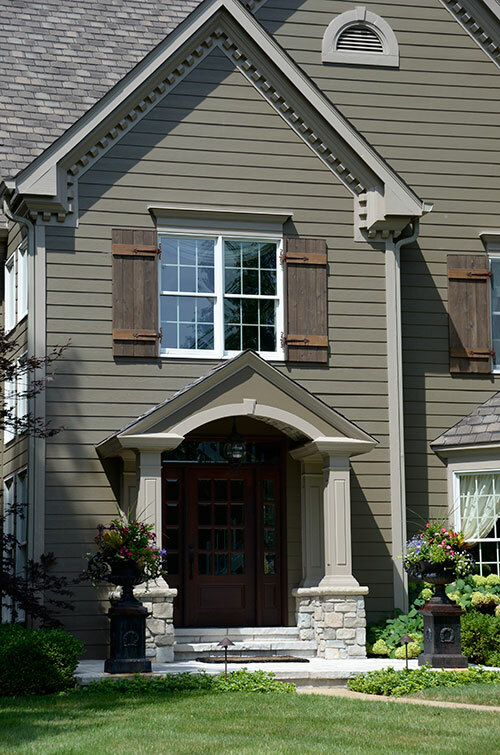 Because Lakeside Exteriors makes customer satisfaction their number one priority, daily progress on the home did not interfere with the homeowners’ lives. Bernie and Bernadette were extremely impressed that no matter what progress was made in a day or what would need to be completed the next day, work areas were tidied up before the crew left the site. 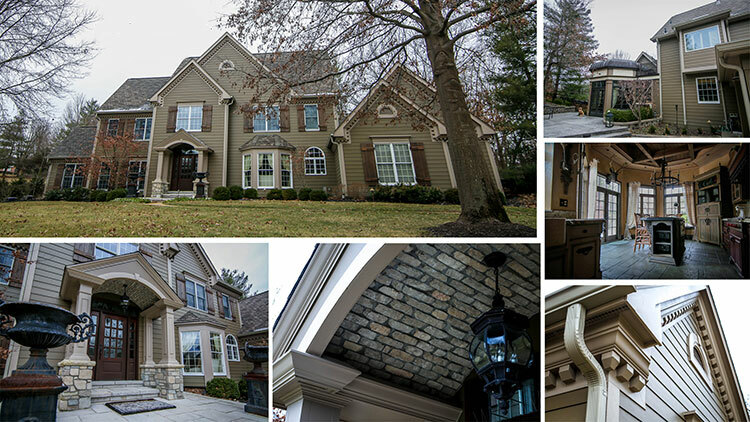 To make the home functional but also give the clients the perfect aesthetic of their dream home, Lakeside provided a unique custom design for the new entryway. 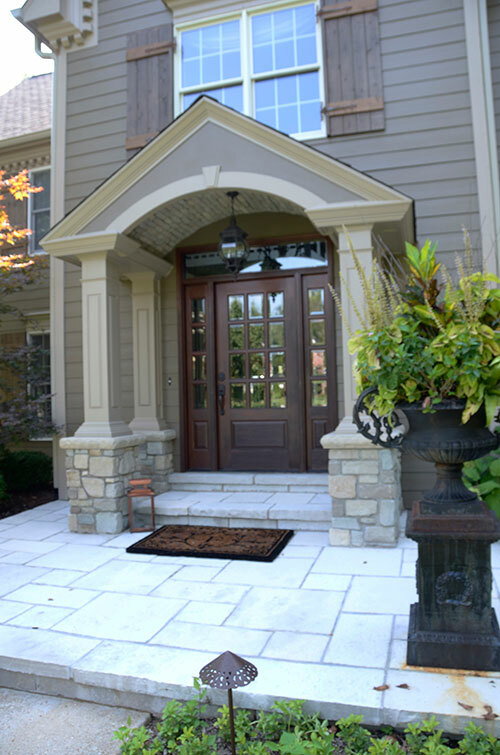 A beautiful front entry door system was installed, along with a functional and picturesque overhang. Lakeside used top notch, Sherwin Williams exterior paint on the project to protect and enhance the design. Custom stone pillars and columns, masonry ceilings, and designer concrete floors added the architectural elements the clients desired. The new home addition houses a kitchen which is a beautiful, comfortable, and a truly state-of-the-art facility with many unique trim designs and accessories. 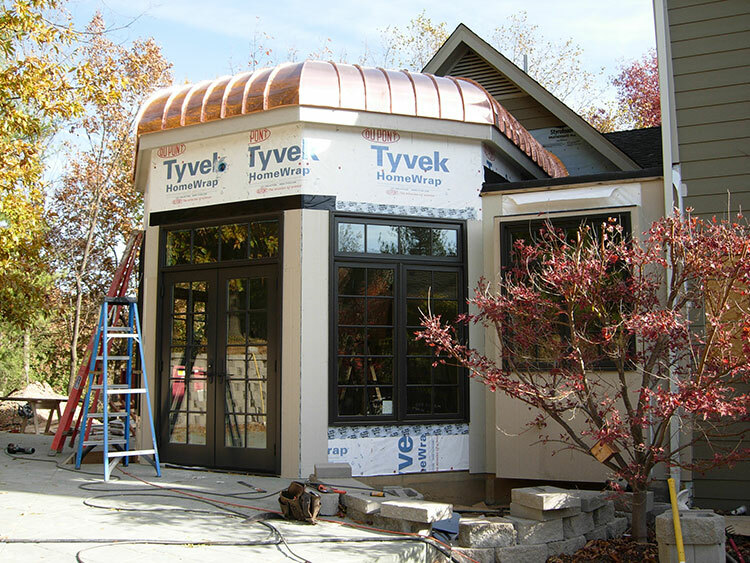 Lakeside installed a copper roof, new Infinity from Marvin windows and doors, and updated cabinetry with modern appliances. Lakeside also added a designer, concrete patio onto the addition, as well as provided the design and installation of one of the home’s interior bathrooms. “We wish to congratulate you on a job well done. We love the new look of our home as do our neighbors and friends. It is so improved that many people do not even recognize it. And we have the designer staff at your company to thank for that. The new porch and its’ design is fantastic. The back of our home also has an entirely new look – thanks to your company. In fact, the home has an entirely new look – everywhere! One of our neighbors was so impressed that they have become your customer also! The work spoke for itself, and upon seeing the quality of the finished project—not to mention the use of durable materials—the home became a showpiece, eliciting nine new clients in the neighborhood. 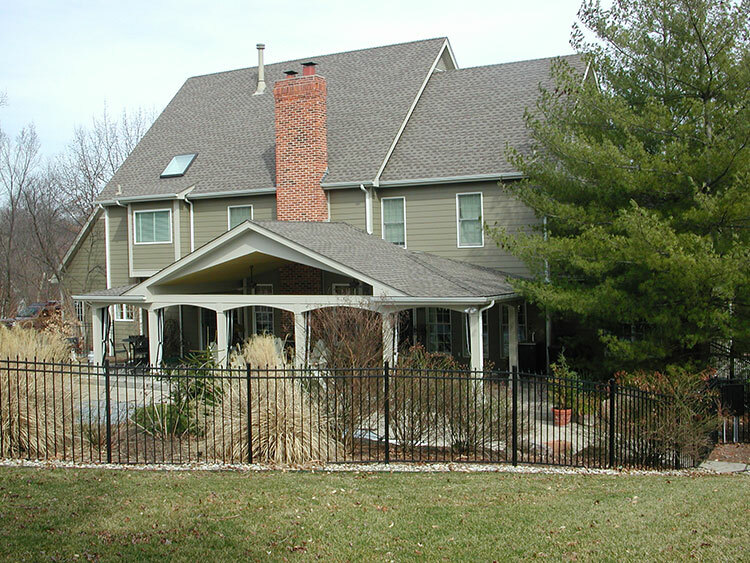 With Lakeside exceeding customer expectations, the couple has since happily become a reference for prospective customers and has provided many testimonials for their go-to contractor. The couple even attended many open house events to promote a company that makes customer satisfaction their highest priority. Bernie and Bernadette live in a functional and picturesque home both inside and out and can now call their house their dream home.